I was in Svalbard specifically to look at public art deployed around Longyearbyen—the statues of polar bears and miners, and the light works on the Global Seed Vault for example—as part of my examination of how a brandscape was being constructed in the Arctic. 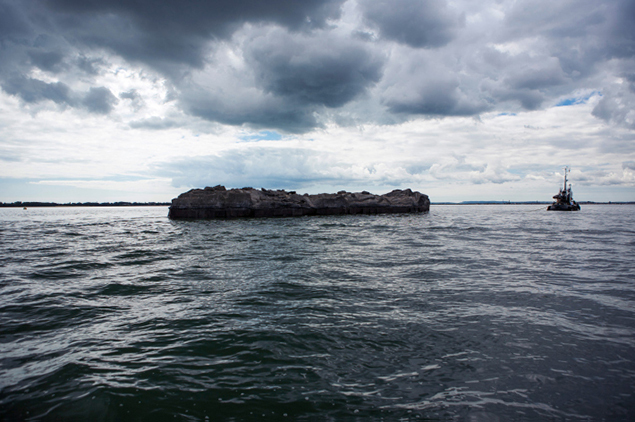 But I was also interested in the larger realm of artmaking in the archipelago. One of the first topics to research was 19th century tourism postcards, the earliest of which date from 1896 and tended to feature fjords, polar bears, glaciers, and the midnight sun. 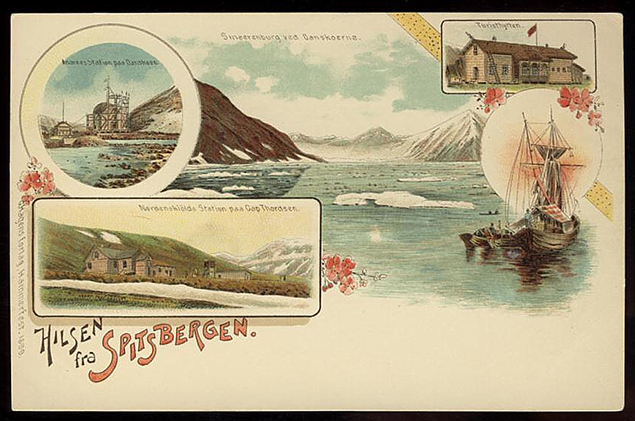 Hilsen fra Spitsbergen (“Greetings from Spitsbergen”) printed by G. Hagens forlag in 1899. Modern-day glossy color postcards focus mostly on promoting touristic views of polar bears and the auroral borealis, and most Svalbard art during the 20th century remained based on landscape painting traditions. This was in line with what I expected, comparable to the branding of the Swiss Alps, the Norwegian fjords, the Grand Canyon and so forth in the Euro-American tradition of the sublime. 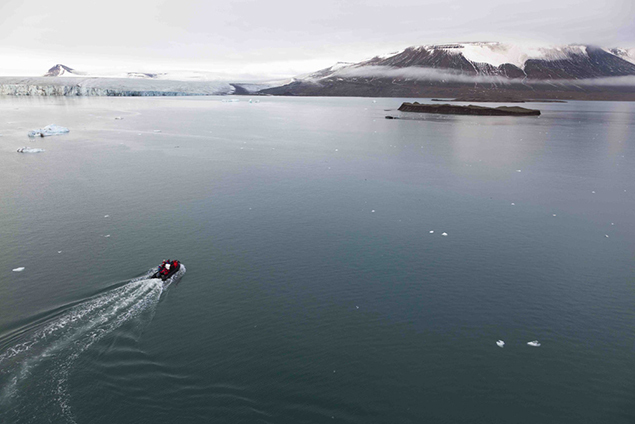 But in 2003 the art of Svalbard went decidedly contemporary when David Buckland began taking major contemporary artists, such as Antony Gormley and Rachel Whiteread, to the archipelago in an effort to engage the public with climate change. He has since led eight art & science expeditions to the islands. The popular Arctic Circle program soon offered similar opportunities for a price, although now the best option for artists may be simply to book passage on the ship everyone uses, the ice-strengthened two-masted schooner Noorderlicht, which is stationed in Longyearbyen. I want to focus on just one artwork arising from those voyages, Nowhereisland by British artist Alex Hartley, who sailed with Buckland in 2004. While circumnavigating Spitsbergen, Hartley found an island about the size of a football field that had recently emerged as a glacier was retreating. He was the first human being to set foot on the tiny patch of newly revealed land, which was eventually named Nyskjæret. Image of Nyskjæret when first discovered. Image courtesy of Alex Hartley. Hartley returned to the island in 2011 and moved some of its glacial till onto a barge. Once Nowhereisland was in international waters, Hartley declared it an independent nation. He then proceeded to have it tugged to Weymouth, England and then around the southeast coast to end in Bristol, a 2000-mile-long journey that ended when the island was dismantled and given away in pieces. Nowhereisland under tow. Image courtesy of Alex Hartley. The ice goes out, new lands are uncovered, territorial squabbles arise over national maritime boundaries . . . Hartley’s intervention is a self-aware land art performance, and he cites, among other works, the floating island barge envisioned by Robert Smithson, Tania Kovats’ Meadow barge from 2007, and When Faith Moves Mountains, the Francis Alÿs performance piece of 2002. But it is also political theatre that highlights global warming, international competition for natural resources, and the fickle nature of national boundaries. Svalbard, by virtue of its location at the limits of sustainable habitability, is like the Antarctic, its communities dependent on outside resources for survival. Unlike the Antarctic, however, it’s relatively close to the developed world and thus able to host a range of artists seeking to engage the edge of civilization as an arena for their work. I use the word arena, as any art committed in such difficult locations has an element of performance to it, even just erecting a view camera or a painting easel, much less moving part of an island. Most of the contemporary art made in the archipelago is less about permanent installations, and, very unlike works on the Norwegian mainland that are commissioned in order to attract tourism. is more pointed at issues. Before Nowhereisland was dispersed, it had attracted 23,003 people from 135 countries to sign up as citizens, who wrote the constitution for Nowhereisland, which in its first iteration consisted of one hundred principles and conditions. It remains online, a provocation about the nature of migration and global change. Nowhere island. Now here is land. No where is land. 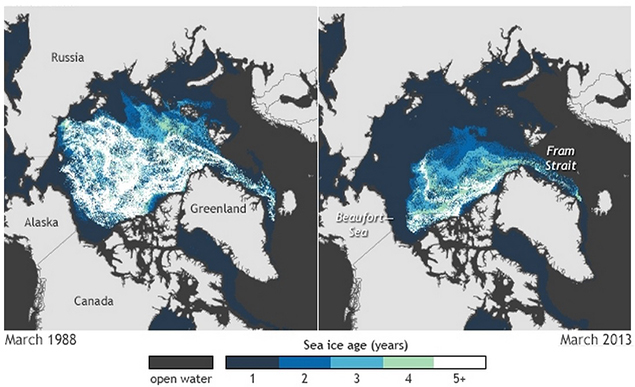 Map of Arctic sea ice thickness and extent, March 1988 vs. March 2013. Svalbard is the star-shaped land halfway between the coast of Norway in the upper right and Greenland. Image courtesy of the NOAA Climate.gov team, based on data provided by Mark Tschudi, University of Colorado. This post was also published at the Center for Art + Environment Blog. Feature image: A David Buckland “Ice Text” from 2004-2005. Image courtesy of Cape Farewell.